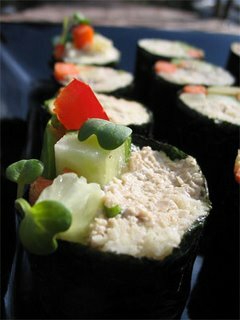 These light rolls are wrapped with thinly sliced cucumber instead of nori. A sharp knife and a steady hand are necessary for neat cucumber rolls. Serve with red sesame dipping sauce or white ginger dipping sauce. Peel the cucumbers and cut off the ends. Cut the cucumbers in half across the seeds. Using a sharp knife, carve a thin “sheet” of cucumber, rotating the cucumber against the blade of the knife. Create an uninterrupted piece, stopping only when you reach the seeds. Repeat with the other cucumbers. Set aside. Peel the carrots. Thread carrot with a saladacco or peel to the core with a peeler to create delicate ribbons. Cut the avocado in half. Chop the blade of a chef’s knife into the avocado pit. Twist the knife to neatly extract the pit. Cut into slices while still in the skin. Scoop out the slices with a spoon or peel away the skin. This light dipping sauce is great with any sushi roll.